US to mint trillion dollar platinum coin? For a limited time only, we are offering a 1% discount on 2013 Royal Mint Gold and Silver Britannia and Gold Sovereign Coins. Each Royal Mint coins is Capital Gains Tax Free (CGT), meaning that you'll not pay any tax on any profits once you come to sell your investment bullion coins. For further information or to buy online now with your debit card, credit card or electronic bank transfer, click the view and buy button on the products below. 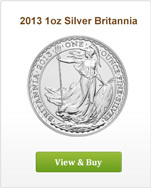 Looking for other Capital Gains Tax Free Royal Mint coins? 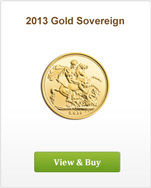 Take a look at our Sovereign, Half Sovereign and Britannia Coin categories.